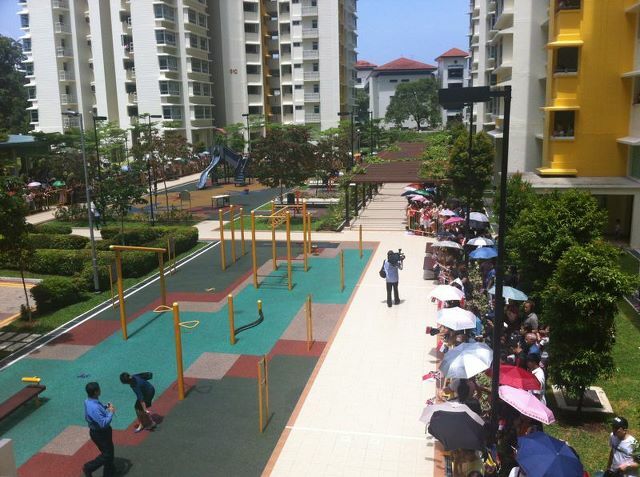 William and Kate visited Strathmore Green, a precinct in Queenstown, a residential area in Singapore which was chosen because it was named after Queen Elizabeth II. 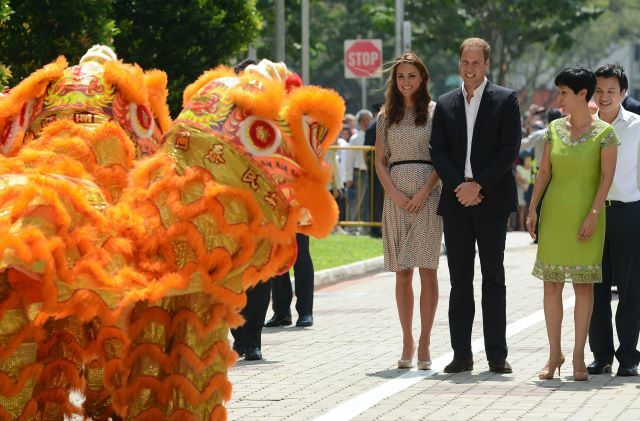 The couple were greeted by a lion dance troupe much to their amusement. Kate received a posy from a little girl. Children warm to the Duchess so easily and it's great to see her interacting with them. Adorable photo. The crowd await William and Kate's arrival. The couple viewed cultural performances that showcased the three main cultures of Singapore: the Chinese, Malay and Indian communities. The royals visited the Rainbow Center next, a school and community centre for children with special needs. An adorable shot of Kate meeting a little boy at the Rainbow Center. In 1992, Rainbow Center Singapore was established as a registered charity. The centre runs two special needs schools and two Early Intervention Programme centres at Rainbow Center. All the centre's programmes adopt a holistic developmental curriculum in the areas of language and communication skills, cognitive skills, social and emotional skills and adaptive daily skills. If you wish to support the center you can find all relevant information about donating here. 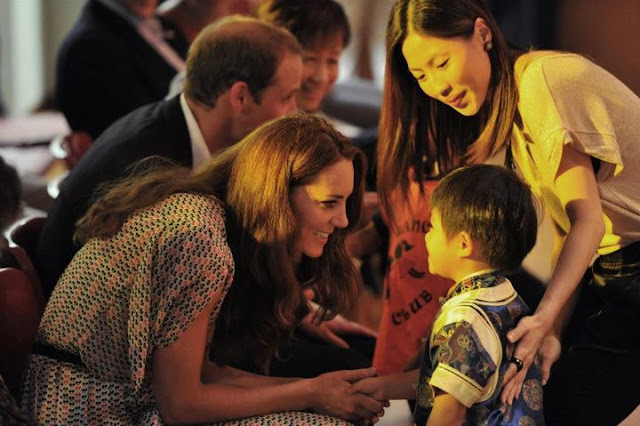 Kate met children in an art therapy class and William took part in a physical education class. The centre is celebrating its 20th anniversary this year, a very appropriate time for a royal visit. Kate also took part in an art class during the Canada tour and one of her patronages is The Art Room. As a History of Art graduate Kate is obviously passionate about art and is utilizing that in her role as a member of the royal family. Royal fans were certainly enthusiastic to see the couple. 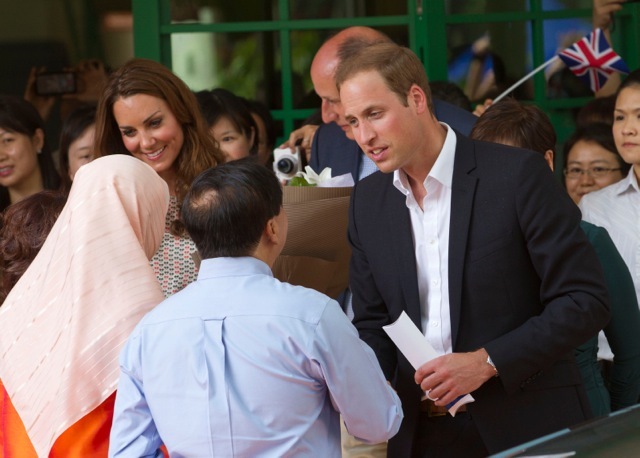 Kate made a quick change into an outfit by Singaporean label RAOUL. The brand is helmed by Douglas and Odile Benjamin and began as a men's shirt label. It has evolved into a full collection of ready- to- wear for men and women including accessories and timepieces. Celebrities such as Helen Mirren and Elle MacPherson have been seen in RAOUL. Kate wore the ivory Silk Print Pleated Skirt and the Tara Top. The print pieces retail for €279 and €206 respectively at Matches. I love the silk print and think it's a very pretty, floaty look. Essential given the humidity in Singapore and it's wonderful to see Kate supporting Asian fashion. 'Work geometric prints on and off duty. A red and black cube -heart print is reminiscent of vintage 70s styling. Raoul puts a retro-cool slant on ladylike new-season dressing'. A look at the back of the pieces. 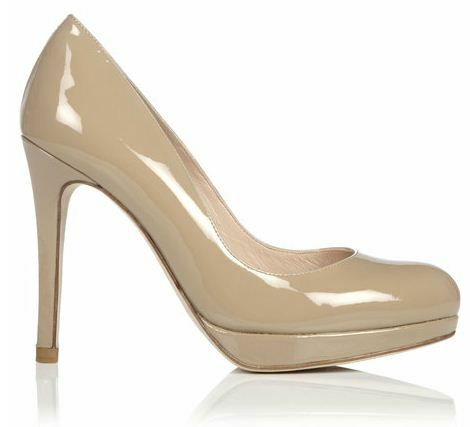 Kate wore her favourite LK Bennett Sledge Pumps. 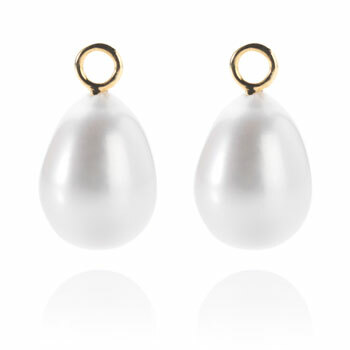 The Duchess accessorized with her Annoushka baroque pearl earrings. Exactly, very pretty and floaty look! Thanks for your quick and nice coverage Charlotte! Just one negative -those hair, those hair! This is why she pays the personal hairdresser? To sport loos messy hair? This morning was more or less okay,although visibly figthing the weather but this occassion already screams for a nice ponytail!! She looks sooo good in them I don´t know why she doesn´t wear them more, in privacy she sports them quite often so she obviously feels good in them. Also Prabal Grunung dress was screaming for a simple bun as she wore in Canada with the purple Issa due to the upper part of the dress where the ornament was "blooming" and the back-cut neckline. For me is such a pity - so beautiful outfits and always the same hair. Oh wonderful morning news here for me in Germany! :-) Thank you Charlotte! I like her dresses so far. They seem so fresh and young- modern and classy at the same time! Wow Matthew, how exciting. I hope you're having a wonderful time and enjoying the tour. Perhaps you will see the royals again? I'm not expecting a tiara tonight but we could be pleasantly surprised. It's amazing to see Kate supporting Asian designers. O you're a lucky person Matthew! Fantastic! It's wonderful! I actually went to the Gardens to see them but my oh my it was so crowded I couldn't see them at all! 5000 people or MORE. then I got my dad to go to Queenstown for me to take pictures I wonder if he managed to... if I was in school I would have rushed there, my school is really close to there..
Well, so far she's been dressing brilliantly and I expect more of the same throughout the rest of her tour! Crossing my fingers for a tiara ^^ I hope to catch them at the airport tomorrow as I live quite close..
Do let us know if you see them. How exciting! Thank you Matthew and most importantly enjoy the royal visit! That is amazing Matthew. I heard Kate's wearing a blue and white Erdem dress but have not seen photos yet! It must have been wonderful to see Kate again. I'm delighted you've been able to spot her! aaaww, I wish the Duchess could read such nice posts like this from Matthew! And I wish she could read this wonderful (and absolutely not intrusive but very respectfully) blog! I love both outfits. Class, class, class! And William is beyond handsome. What a striking couple! I read your blog everyday.. I am addicted to your blog :) The way you select and present information is professional. Thank you for creating such a wonderful place ! I too wish she would style her hair a bit differently from time to time. She's so lucky to have those glorious locks to put up or leave down. Loving her clothes up till now, except for the wedges with that dress, of course... Much too chunky, but probably very comfortable. Would just like to point out that Raoul is not only an Asian brand, but a Singapore brand, hence the connection. Go Kate! Thanks Charlotte for your quick updates! Lovely to come home from college early and have not one but two new posts to read :D hope your not too tired staying up to do these blogs due to the time difference! Looking forward to the reception later on. Thanks for the quick update Charlotte!Kate looks awesome and the dress choice is perfect for the weather! Can't wait for your next post!!! Looking at this dress flows, I bet it was super cool and floaty in the hot weather. Only thing I don't like about it - it looks a little translucent up top, you can clearly see an outline of Kate's bra or lining of the dress. Love the outfit, I thought it was a dress at first! Love the Raoul outfit, especially the sleeves. Not so keen on the McQueen one, sorry - it's the wedges that ruin it for me. I have indeed, It's great Kate still loves the outlet village and royal life hasn't changed that. definitely not my fave outfit but probably nice and breezy in the heat for her. she is definitely glowing in her gorgeous fuller figure. I rushed out to the nearest Raoul boutique to get my hands on the exact same blouse that she wore! So glad that I now own a piece of clothing similar to the Duchess'! Crazy, I know. 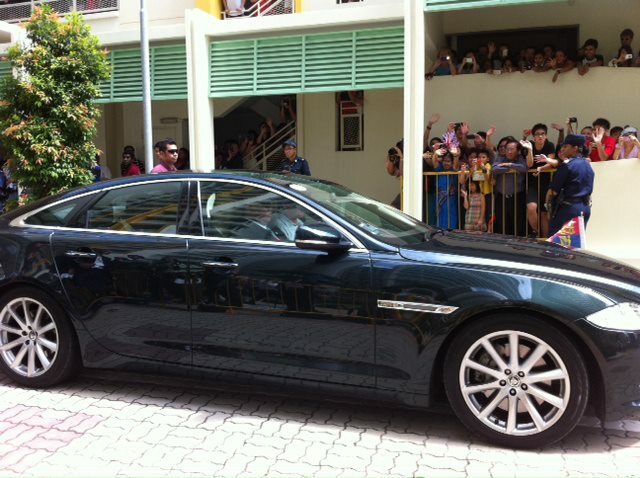 I saw both Wills and Kate , 2 metres from where I was standing at the Raffles Hotel. They are an absolutely gorgeous couple.